Check out our free templates and free campaign slogan generator for great ideas to get you started! 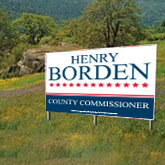 Need extra help to create the absolute best campaign signs? 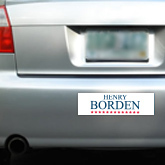 Contact us for ideas on ways to help your campaign signs stand out from the crowd. We have options to add your photo, cut out custom shapes, flip your sign to be tall and narrow, add unique colors to help your custom election signs pop. Shop Custom Election Signs That Will Help You Get Elected! Your primary goal is to get elected. 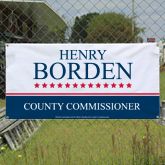 We are here to help with a variety of custom election signs. Once you have a logo design, your goal should be to showcase it in as many locations as possible. Multiple impressions stick in people’s mind, just look at the great success google has had with remarketing campaigns! 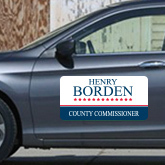 So put your logo on your vehicle with political magnets or bumper stickers, post it along heavily traveled roads with yard campaign signs or even where allowed, big site signs. You can also hang political banners on available fences or buildings. Tell your story and connect with your support base using business cards, palm cards, flyers and more!